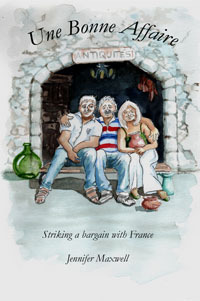 For more than twenty years Geoff and Jennifer have travelled the highways and byways of France, buying antiques and brocante, and hosting small groups and individuals who wish to do the same. Their greatest pleasure is to enable others to make their own bonne affaire with France - to engage with the French and to truly experience this glorious land. Whether you are a French dreamer or an intrepid traveller, a lover of all things French or a seeker of joie de vivre, they invite you to join them on their journey into the heart of France and to take advantage of the expertise and knowledge they have to offer. After many years buying brocante in France, we would like to share our expertise with you, to introduce you to the magic of the market and ship your treasures back home. Geoff and Jennifer invite you to join them for a week in Touraine, staying at an ancient priory, exploring markets, bric-à-bracs and antique shops and visiting royal châteaux and Renaissance towns in the valley of the Loire and stunning little villages on the peaceful Indre River. Let us know your travel plans and your interests and desires and we will map out a self-drive itinerary to suit you. We are well acquainted with the back-roads, the markets, the hidden attractions and most beautiful villages in France - in Brittany, Burgundy, the Loire and the Languedoc; the Charent, the Vienne and the Dordogne. And we will include our Big Long Paris Walk - a guide built up over twenty years for friends and guests which includes several long walks in Paris that encompass the main attractions, as well as places the tourist rarely discovers. The definitive guide to French markets and to locating and buying brocante in France. Written to inform and amuse our guests, this book is a must for those who want to go it alone. We still buy antiques and brocante and keep a selection for our clients. From time to time we will feature collections of antique linen, tapestry, copper and ornamental pieces on these pages. To be informed you will need to be on our mailing list. We can provide assessments or full editing of manuscripts, layout, publishing and printing, at a reasonable cost. Geoff and Jennifer spend their New Zealand summers in the historic village of Akaroa, writing, publishing books and selling brocante. During winter you will find them on a short fat canal boat somewhere in Burgundy. You can follow their adventures on FaceBook.